Vietnam shipped abroad 264,000 tonnes of rice in October this year for 136 million USD, pushing the total figures so far this year to 5.2 million tonnes worth 2.6 billion USD, up 1.7 and 14.1 percent year-on-year. China remained the leading importer of Vietnamese rice with a growth rate of 24 percent. Strong rises were also seen in many other markets, such as Indonesia, Iraq, the Philippines, and Malaysia. Average rice prices in the first nine months of 2018 reached 503 USD per tonne, up 13.7 percent year-on-year. The highest price was recorded for Jasmine rice with 575 USD per tonne, followed by Japonica with 526 USD per tonne. The export of medium- and high-quality rice increased, while that of low quality types reduced, now accounting for just 2 percent of the total export volume. On October 18 this year, the Philippines closed its bidding and decided to buy 47,000 tonnes of rice, including 28,000 tonnes from Vietnam. The same day, Egypt invited bids for 25,000 tonnes of rice in 2018. 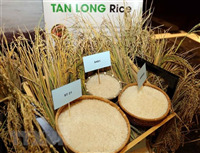 Meanwhile, within the framework of the 10th World Rice Conference in Hanoi, many contracts were signed, including a 2.5 million USD contract signed between the Hanoi Trade Joint stock Corporation (Hapro) and its Australian and Malaysian partners. According to the Department of Agro-Product Processing and Market Development under the Ministry of Agriculture and Rural Department, domestic rice prices will continue to rise as buyers purchase more materials for their export orders. Currently, many localities have finished the harvest of their summer-autumn crop, while some others start to harvest their autumn-winter crops. The prices of rice of autumn-winter crops have increased slightly due to a shortage in supply. In Vinh Long, rice price is between 5,300 VND per kilo and 10,000 VND per kilo, while that in Bac Lieu varies from 6,200 VND per kilo to 6,300 VND per kilo./.